This study aimed to investigate the impact of Wenyang Huoxue Lishui Formula (WHL) on the expression of Cathepsin L (CaL) in the renal podocytes of rats with doxorubicin-induced nephrosis (AIN). The AIN rats were treated with WHL for 4 week, and then 24 h urinary protein excretion (24- UP), serum total protein, and albumin were measured. Immunohistochemical method was used to observe the expression of CaL in the glomeruli, immunofluorescence staining was used to observe the expression of synaptopodin, and other renal pathological changes were observed simultaneously. WHL decreased 24-UP, increased both serum total protein and albumin, and decreased blood lipids (p<0.01). In addition, treatment with WHL downregulated CaL, upregulated synaptopodin, and improved the fusion of foot processes in the podocytes. WHL can down-regulate CaL and up-regulate synaptopodinin AIN rat models, thus helping to stabilize the actin skeleton, improve the fusion of podocytes, and reduce proteinuria. Wenyang-Huoxue-Lishui formula, Adriamycin, Minimal lesion, Nephrotic syndrome, Cathepsin L.
Nephrotic Syndrome (NS) is a group of clinical conditions characterized by massive proteinuria and hypoalbuminemia, resulting in oedema and hypercholesterolemia. Massive proteinuria of NS is caused by the impairment of the glomerular filtration barrier. Podocytes surround the outside of the glomerular filter and are crucial for maintaining normal ultrafiltration function. Disruption of podocyte function damages the kidney filter, thus resulting in proteinuria. It is now widely accepted that the progression of proteinuria is a risk factor for the progressive destruction of the kidneys, which ultimately leads to end-stage renal failure . Podocyte cellular morphology is tightly connected to its function . The structure of a podocyte consists of a cell body, major processes, and interdigitating Foot Processes (FPs), which are actin-driven membrane extensions. Changes in podocyte structure due to reorganization of the actin cytoskeleton lead to the effacement of foot processes, which is typical in patients with nephrotic proteinuria. Thus, it can be concluded that therapeutic approaches to protect these cells are important to minimize proteinuria and effectively treat NS. Recently, cytosolic Cathepsin L (CaL) has been shown to be involved in proteinuric kidney disease . The first evidence came from a rat glomerulonephritis model, in which the cathepsin inhibitor, E-64, reduced experimental proteinuria . Another study demonstrated that CaL mRNA and protein were elevated in rats that developed proteinuria by Puromycin Aminonucleoside (PAN) treatment . In the same report, cultured podocytes from mice lacking CaL were protected from PAN-induced cell detachment . FP effacement can be inhibited by blocking CaL activity or protecting target proteins from CaL-mediated cleavage [6,7]. Synaptopodin (SYN), an actin-binding protein that may contribute to actin-based podocyte shape and motility, is a substrate of cytosolic CaL. SYN deficient mice displays impaired recovery from protamine sulfate-induced podocyte FP effacement and Lipopolysaccharide (LPS)-induced NS . Several studies have revealed a loss of SYN expression in renal biopsy specimens from patients with focal segmental glomerulosclerosis [9,10]. Protection of SYN from CaLmediated degradation reduces proteinuria . Therefore, interventions targeting CaL may offer a new therapeutic strategy that would prevent CaL-induced SYN degradation and ameliorate FP effacement, thus attenuating proteinuria. Wenyang Huoxue Lishui Formula (WHL) was developed for the treatment of NS in Hubei Hospital of Traditional Chinese Medicine. WHL consists of 11 herbs, which were selected based on traditional Chinese medicine by senior, experienced physicians. Clinic investigations have revealed that WHL can effectively ameliorate proteinuria and reduce the relapse of NS in children. The mechanisms of WHL’s protective effects are still unknown. Therefore, in the present study, we explored the effectiveness of WHL in improving NS in a rat model and the involvement of CaL-mediated SYN degradation in this process. To this end, we established an experimental Minimal Change Disease (MCD) rat model with podocyte FP effacement by injecting doxorubicin via the tail vein. Fifty-one male Sprague Dawley® rats, weighing 200-250 g, were purchased from the Center of Experimental Animal of Hubei Academy of Medical Sciences. The rats were housed in a temperature- and humidity-controlled environment with free access to tap water and standard rat chow. This study was carried out in strict accordance with the recommendations in the Guide for the Care and Use of Laboratory Animals of the National Institutes of Health. The animal use protocol has been reviewed and approved by the Institutional Animal Care and Use Committee (IACUC) of Hubei university of Chinese medicine. WHL consisted of 10 g Radix aconite lateralis preparata, 5 g Cortex cinnamomi, 30 g Astragalus membranaceus, 6 g Ephedra, 10 g deerhorn glue, 10 g Grifola, 10 g Ligusticum wallichii, 5 g Safflower, 10 g Leonurus japonicus, 3 g Hirudo, and 10 g Bidentate achyranthes root. The WHL was prepared by China Resources Sanjiu Medical and Pharmaceutical Co., Ltd. as a dry powder (Shenzhen, China). The dry powder was dissolved in triple-distilled water to 200% (w/v), autoclaved, and then stored in aliquots at 4°C until use. NS was induced in 45 rats by tail vein injection of doxorubicin (ADR) (5.5 mg/kg body weight; Zhejiang Hisun Pharmaceutical Co. Ltd., Taizhou, China), diluted in saline. After ADR injections, the rats were randomly divided into three equal groups, group II (ADR-treated), group III (ADR group also treated with prednisone), and group IV (ADR group also treated with WHL). In addition, 6 rats were injected with saline alone and represented the control group (group I). During the experiment, three rats in groups II, III, and IV died. The rats in group III were administered 12 mg/kg/d prednisone (Shanghai Zhong Xi Pharmaceutical Co., Ltd., Shanghai, China) and those in group IV were fed WHL (3 ml/d) for 30 d.
On the 7th and 30th day (D7 and D30, respectively) after the injection of ADR, each rat was placed in a metabolic cage individually to obtain 24 h urine collections to measure urine protein (24-UP) and albumin excretion. The rats were then anesthetized and euthanized with sodium pentobarbital. Five milliliters of vein blood from the right ventricle of the heart was sampled for the determination of plasma protein, albumin, triglyceride, and cholesterol. The kidneys were excised, weighed, and decapsulated. Half of each kidney was immediately snap-frozen in liquid nitrogen for later immunofluorescence. The other half was fixed in 10% buffered formalin for histology and immunohistochemistry. The urinary albumin concentration and urinary protein excretion were measured by time-resolved fluorometric immunoassay (Feng Hua Bioengineering Corporation, China) and sulfonic acidsodium sulfate turbidimetry, respectively. The plasma protein, albumin, triglyceride, and cholesterol were assayed with an automatic analyser (Beckman CX 9, USA). Tissue sections were deparaffinized in xylene and rehydrated. Slides were immersed in citric acid buffer (0.01 M, pH6.0) and heated in a microwave oven (800 W for 2 min and then 200 W for 8 min) for antigen retrieval. The slides were rinsed in Phosphate Buffered Saline (PBS). Endogenous peroxidase was blocked with 0.3% H2O2 in methanol for 30 min at room temperature. After a 30 min blocking step with normal goat serum (3% v/v in PBS), rabbit anti-CaL (1:50 dilution; Abcam, Cambridge, UK;) was applied and incubated overnight at 4°C in a humidified chamber. After multiple PBS rinses, the slides were exposed to secondary antibodies. The detection system, Dako EnVision HRP (Dako A/S, Copenhagen, Denmark), was an avidin-free, two-step indirect method with goat anti-rabbit immunoglobulin conjugated with Horseradish Peroxidase (HRP) as the secondary antibody. The secondary antibody was incubated for 30 min at 37°C, and the sections were developed with H2O2 plus 3, 3’-diaminobenzidine tetrahydrochloride solution for 5 min. Primary antibody was replaced by normal rabbit IgG for the negative control. Finally, the sections were incubated with haematoxylin and dehydrated. The sections were examined with light microscopy, with positively stained areas appearing brown or yellow. In total, 20 fields per kidney section (three to four sections per kidney, X200 magnification) were observed. The CaL staining in glomerular fields was evaluated by Image Pro Plus analysis software 6.0. Positive signals were quantified as mean optical density (integrated optical density/area). Frozen slides were removed from the freezer and dried for 20 min under a cold air blower. Slides were then fixed in acetone at room temperature for 10 min, followed by three PBS rinses, 5 min each. After a 30 min blocking step with normal goat serum (3% v/v in PBS), rabbit anti-SYN (1:50 dilution; Abcam) was added and incubated overnight at 4°C in a humidified chamber, followed by three PBS washes, 5 min each. The secondary antibody, FITC-labelled goat anti-rabbit IgG (1:60; Pierce), was incubated for 30 min at 37°C in a humidified chamber. After PBS washing (3 × 5 min), the nuclei were stained with 4’, 6-diamidino-2-phenylindole (DAPI; ZSGB, Beijing, China), and the sections were mounted with Citifluor. Primary antibody was replaced by normal rabbit IgG for the negative control. Kidney tissues were embedded into paraffin, serially sectioned (4 μm thickness), rinsed with distilled water, immersed for 10 min in 1% aqueous periodate, and then rinsed with distilled water three times. The sections were differentiated, followed by staining in Schiff's reagent for 20 min. After staining, the sections were washed three times with sulfite and distilled water, followed by counterstaining with haematoxylin to identify nuclei. The slides were observed under a light microscope (Olympus BX51) at 400X magnification. After PBS rinsing, the kidneys were cut into small blocks and subsequently immersed in buffered 2.5% glutaraldehyde fixative. After rinsing three times in PBS (pH 7.4), the samples were fixed with 1% OsO4 and then dehydrated twice through alcohol gradients (50%, 70%, 80%, 95% and 100%) for 15 min each. The samples were then dehydrated twice with 100% acetone for 15 min before being embedded in Epon 812. Ultrathin silver-gold sections were prepared using an LKB-V ultramicrotome (BROMMA, Sweden), transferred to copper grids (50 mesh) coated with Formvar membrane, stained with both uranyl acetate and lead citrate, and observed with a Hitachi H600 Transmission Electron Microscope (Hitachi, Tokyo, Japan). The data are presented as mean ± SD and analysed using oneway Analysis of Variance (ANOVA) followed by Student- Newman-Keuls post hoc test. A p-value<0.05 was considered statistically significant. The rats in group I exhibited lustrous fur, agile movements, good spirit, and good appetite. The rats in the remaining groups exhibited weight loss, lethargy, back hunching, body scrunching, sparse fur, and significantly reduced food and water intake on D10-14; these rats also had occasional loose stools and oedema of the limbs and scrotum. The rats in group IV and III increased their eating, drinking, and activity after two week of treatment; the rats in group IV also exhibited significantly increased urine volume, and their weights slowly recovered. The rats in group III seemed restless and irritable. During the experiment, three rats in groups II, III, and IV died. The levels of 24-UP in groups II, III, and IV after one week were significantly greater than that in group I (p<0.01), but no significant differences were found among groups II, III, and IV (p>0.05). After five week (i.e., after four week of therapeutic treatment), 24-UP levels in group II had increased. The levels of 24-UP in groups III and IV were now lower than that of group II (p<0.01), but were still significantly higher than that of group I (p<0.01) and showed no significant differences amongst themselves (p>0.05). Therefore, the 4-week treatment using either prednisone or WHL significantly reduced 24-UP excretion in the AIN rats, but not to normal levels (Table 1). Note: Compared with group II in the same period, ★P<0.01; compared with group I, ▲P<0.01. Table 1: 24-UP, TP and ALB in each group (mg/24 h, ͞x ± s). At 5 week, the levels of serum TP and ALB in group II were lower than those in group I (p<0.01), indicating that the rats in group II exhibited significant hypoalbuminemia. After 4 week of treatment, the levels of TP and ALB in groups III and IV were lower than those of group II (p<0.01), but did not return to normal levels (p<0.01, compared to group I) (Table 1). The level of CaL in group II was significantly upregulated compared to that of group I (p<0.05). The levels of CaL in groups III and IV were significantly lower than that of group II (p<0.05 for both comparisons), indicating that both WHL and prednisone can reduce the expression of CaL. However, the reduction of CaL in group IV was greater than that in group III (p<0.05) (Figure 1). Figure 1: Immunohistochemical results of CaL in renal tissue of each group. A: Group I; B: Group II; C: Group III; D: Group IV (X400). Compared with group I in the same period, P<0.01; compared with group II, P<0.01; compared with group III, P<0.05. After 5 week, the levels of SYN in group II significantly decreased compared to group I (p<0.01). However, the SYN levels in groups III and IV were significantly higher from those in group II (p<0.01), indicating that WHL and prednisone can reduce the degradation of SYN to a certain extent (Figure 2). 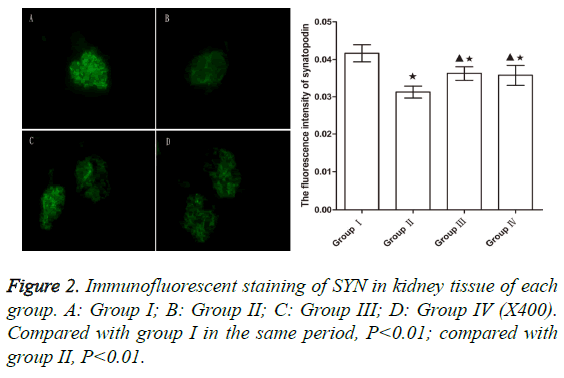 Figure 2: Immunofluorescent staining of SYN in kidney tissue of each group. A: Group I; B: Group II; C: Group III; D: Group IV (X400). Compared with group I in the same period, P<0.01; compared with group II, P<0.01. Light microscopy: The mesangial matrix in the rats of group II showed slight cellular proliferation, while the mesangial matrix in groups III and IV rats showed no obvious proliferation. When compared to group II rats, there were no apparent improvements in the pathology of group III rats, but an obvious improvement was seen in the group IV rats (Figure 3). Figure 3: PAS staining of kidney tissue in each group. A: Group I; B: Group II; C: Group III; D: Group IV (X400). 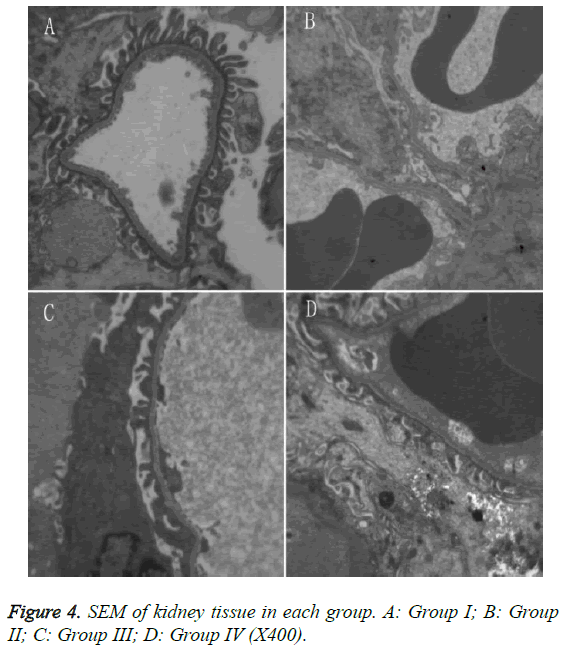 SEM: Group II rats exhibited extensive fusion of the glomerular foot processes. Group III rats exhibited fusion of most FP epithelial cells, which appeared similar to that of group II. Group IV rats exhibited smooth glomerular basal membranes with no thickening, and the extent of FP fusion was reduced compared to group II (Figure 4). Figure 4: SEM of kidney tissue in each group. A: Group I; B: Group II; C: Group III; D: Group IV (X400). The morphological changes and physiological manifestations in AIN rats are similar to those in human patients with minimal change nephropathy, so it is widely recognized as an ideal model [11,12]. In our experiments, the AIN rats exhibited significant FP fusion, proteinuria, downregulation of SYN, and upregulation of glomerular CaL, which are consistent with the outcomes of puromycin-induced minimal change NS . In human patients with minimal change NS, upregulation of CaL has been observed , and our study confirmed that WHL can inhibit the upregulation of glomerular CaL and increase SYN. At the same time, WHL can improve the fusion of podocyte foot processes and reduce proteinuria. Proteinuria is one of the main symptoms of NS. Over the past decade, proteinuria has obtained more attention because it has been identified as a risk factor in cardiovascular events and kidney disease progression [13,14]. Reducing proteinuria can effectively delay the onset of these events. Proteinuria in NS is mainly caused by the impairment of the glomerular filtration barrier, and podocytes are critical in maintaining the integrity of this barrier. Podocyte abnormality is very common in kidney disease with proteinuria, including minimal change nephropathy syndrome, focal segmental glomerulosclerosis, membranous nephropathy, and lupus nephritis [7,15,16]. Podocyte abnormality is characterized by cytoskeletal protein restructuring of podocyte FP, which leads to FP fusion, destruction of basement membrane, loss of normal compact structure, and proteinuria . Our experiment also confirmed that the AIN rats showed simultaneous proteinuria and podocyte FP fusion. The maintenance of podocyte specialized structures depends on the actin-based cytoskeleton and the specific protein molecules expressed in podocytes . The podocyte cytoskeletal proteins are critical for maintaining the glomerular filtration rate. Changes to the podocyte actin network structure are prerequisites for the fusion and disappearance of FP and the development of proteinuria . Increased podocyte motility caused by the rearrangement of the podocyte cytoskeleton is the molecular basis of FP fusion. However, podocytes are resilient, and podocyte fusion can be a reversible process. For example, in MCD nephrotic syndrome, FP can be restored to their normal morphology after elimination of the detrimental agent [20,21]. Therefore, based on in-depth understanding of the regulatory mechanisms of actin cytoskeletal proteins and their important roles in maintaining the integrity of the glomerular filtration barrier, therapies targeting the regulation of actin cytoskeletal proteins are expected to be very promising treatments for proteinuria. In recent years, the proteolytic pathway of CaL in the cytoplasm has been found to be involved in the regulation of podocyte cytoskeletal proteins . CaL belongs to the papain family of cysteine proteases, and it mainly mediates the hydrolysis of proteins in lysosomes. Under pathological conditions, a large number of active CaL molecules can be released into the cytoplasm or extracellular space, thus degrading cellular components or intercellular substances. These processes are involved in the metastasis of tumors, as well as the development of arthritis, osteoporosis, and other chronic inflammatory diseases [22,23]. Studies have confirmed that CaL inhibitors reduce proteinuria in rats. CaL-mediated proteolysis plays an important role in the development of proteinuria by multiple etiologies . Enhanced proteolysis by cytoplasmic CaL changes the podocyte actin cytoskeleton from parallel-ordered contractile proteins into dense, disordered networks, resulting in abnormalities of podocyte structure. In animal models with proteinuria, such as the LPS and puromycin mouse models, CaL is upregulated in the kidneys, which exhibit podocyte FP fusion . In addition, some in vitro experiments also show that CaL is upregulated in the cytoplasm of LPS- and puromycin-treated podocytes . CaL gene knockout can protect LPS-induced FP fusion and proteinuria [7,25]. Similarly, CaL inhibitors can reduce proteinuria in experimental rats . CaL mRNA has been found to be upregulated at least 2-fold in the microdissected glomeruli of patients with membranous nephropathy, focal segmental glomerulosclerosis, and diabetic nephropathy, whose renal biopsy specimens also showed upregulated expression of CaL protein . Therefore, during disease progression, the key event resulting in proteinuria and podocyte FP fusion also induces upregulation of CaL (encoded by the CTSL gene) in the podocyte cytoplasm [6,7]. CTSL mRNA is expressed in other tissues, but within the kidney, it is characteristically abundantin glomeruli . 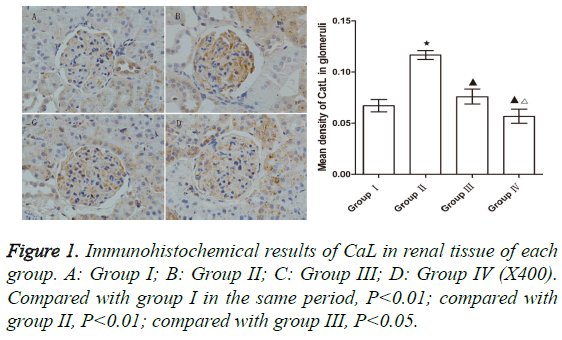 According to a published report , which used immunohistochemistry to detect CaL expression in proteinuric kidneys, CaL was upregulated not only in podocytes, but also in Bowman's capsules and proximal renal tubules. Consistent with prior published results, CaL protein was also upregulated in the AIN rats of this study, which may result in reorganization of the podocyte cytoskeleton, followed by podocyte fusion and proteinuria. SYN is one of the proteolytic substrates of podocyte CaL. As an actin-binding protein, SYN is closely linked with cytoskeletal filaments, specifically expressed when mature podocytes form FP; it is widely used to determine the degree of differentiation of podocytes. Under normal circumstances, SYN is cross-linked with actin in podocytes, thus forming actin filaments that have specific polarity and tension in order to play key roles in maintaining the stability of the actin cytoskeleton and ensuring glomerular filtration function . SYN can influence the aggregation and depolymerization of Factin, thus regulating the “plasticity” of podocytes. Certain animal models and experiments have shown that upregulating SYN protein can diminish proteinuria and podocyte injury, and improve glomerular disease . CaL can hydrolyze SYN, which leads to rearrangement of the podocyte actin system and subsequent proteinuria [3,6,7,19]. WHL can inhibit the upregulation of glomerular CaL in AIN rats and reduce the degradation of SYN. Dendrin is a transcription factor that can regulate the expression of CaL in the cytoplasm. Translocation of dendrin from the membrane to the nucleus can induce higher expression of CaL in kidney cell lysosomes . It is clear that WHL can influence CaL and SYN, but it is not clear whether the effect of WHL on SYN is associated with CaL endopeptidase activity, without affecting SYN transcription. Moreover, additional studies should be performed to determine whether WHL affects upstream dendrintrans location to reduce expression of CaL, improve Sertoli cell fusion, and reduce proteinuria. Clinically, NS is often caused by dysimmunity, so glucocorticoids are often used to treat NS due to their antiinflammatory and immunosuppressive effects. However, NS in our study was not immune-mediated. Relevant studies have reported that glucocorticoids can enhance cytoskeletal stability , enhance polymerization of actin in mesangial cells, and activate cytoskeleton-related enzymes . In podocyte cytoskeletal rearrangement experiments, in which podocyte damage was induced by actin depolymerizing agents (i.e., latrunculin A and cytochalasin D), glucocorticoids acted directly on podocytes, independently from their antiinflammatory and immunosuppressive effects, thus enhancing the stability of the cytoskeleton and moderating damages . In our experiment, prednisone and WHL both improved podocyte fusion and reduced proteinuria, which may be related to their ability to enhance the stability of actin fibers. NS manifests as proteinuria with varying degrees of oedema, so it belongs to the category of oedema disease in Chinese medicine. Oedema is a complex disease condition, in which the symptomatic and radical signs as well as the deficiency and asthenic syndromes vary. For example, symptoms such as oedema, feeling cold to the touch, weak appearance, and pale tongue belong to Exterior-Interior Concurrent Disease, which has diminished Yang with accumulated internal cold-damp (i.e., being “cold and wet”); this disease is caused by declining Yang and a warming deficiency, which leads to the occurrence of systemic oedema. Patients with phlegm should be given warming drugs to neutralize phlegm because dampness can only be eliminated by warming. Yang in the kidneys is the source of Yang in the human body, so warming Yang should be based on warming the kidneys. Warming and reinforcing kidney Yang can agitate its inside Yang, thus normalizing its opening and closing functions. Meanwhile, water retention causes Qi stagnation, and Qi stagnation results in blood stasis, which then can lead to the blockage of Qi-promotion pathways in Sanjiao. Therefore, water retention can increase oedema, namely by the Traditional Chinese Medicine (TCM) theory of “blood can in vivo water can be the disease cause of each other.” Therefore, the treatment of NS should be based mainly on warming Yang, activating blood, and diuresis. In our study, the WHL formula uses Radix aconite lateralis preparata, Cortex cinnamomi, and Deer-horn glue to warm Yang to treat radical signs and Ephedra and Grifola to eliminate oedema to treat the symptomatic signs. The combination of Ephedra and Radix aconite lateralis preparata can enhance the lungs and kidneys simultaneously. Ligusticum wallichii, Leonurus japonicus, Hirudo, and Astragalus membranaceus can benefit Qi and activate blood circulation to treat the radical signs; they can also activate blood circulation and dissipate blood stasis so as to treat the symptomatic signs. The complete WHL formula warms Yang, activates blood, and provides diuresis, so it can strengthen body resistance, eliminate pathogenic factors, harmonize Yin-Yang, and co-implement reinforcement and elimination. The results of this study revealed that WHL significantly reduced proteinuria in the AIN rat model, downregulated CaL, and upregulated SYN. The downregulation of CaL and the upregulation of SYN can stabilize the actin cytoskeleton to maintain glomerular filtration function and reduce proteinuria. In summary, WHL downregulates CaL and upregulates SYN in glomeruli. This stabilizes the actin cytoskeleton, maintains glomerular filtration rate, improves podocyte FP morphology, and reduces proteinuria. Cravedi P, Ruggenenti P, Remuzzi G. Proteinuria should be used as a surrogate in CKD. Nat Rev Nephrol 2012; 8: 301-306. Greka A, Mundel P. Cell biology and pathology of podocytes. Annu Rev Physiol 2012; 74: 299-323. Yaddanapudi S, Altintas MM, Kistler AD, Fernandez I, Moller CC, Wei C, Peev V, Flesche JB, Forst AL, Li J, Patrakka J, Xiao Z, Grahammer F, Schiffer M, Lohmüller T, Reinheckel T, Gu C, Huber TB, Ju W, Bitzer M, Rastaldi MP, Ruiz P, Tryggvason K, Shaw AS, Faul C, Sever S, Reiser J. CD2AP in mouse and human podocytes controls a proteolytic program that regulates cytoskeletal structure and cellular survival. J Clin Invest 2011; 121: 3965-3980. Baricos WH, OConnor SE, Cortez SL, Wu LT, Shah SV. The cysteine proteinase inhibitor, E-64, reduces proteinuria in an experimental model of glomerulonephritis. Biochem Biophys Res Commun 1988; 155: 1318-1323. Reiser J, Oh J, Shirato I, Asanuma K, Hug A, Mundel TM, Honey K, Ishidoh K, Kominami E, Kreidberg JA, Tomino Y, Mundel P. Podocyte migration during nephrotic syndrome requires a coordinated interplay between cathepsin L and alpha3 integrin. J Biol Chem 2004; 279: 34827-34832. Faul C, Donnelly M, Merscher-Gomez S, Chang YH, Franz S, Delfgaauw J, Chang JM, Choi HY, Campbell KN, Kim K, Reiser J, Mundel P. The actin cytoskeleton of kidney podocytes is a direct target of the antiproteinuric effect of cyclosporine A. Nat Med 2008; 14: 931-938. Sever S, Altintas MM, Nankoe SR, Möller CC, Ko D, Wei C, Henderson J, del Re EC, Hsing L, Erickson A, Cohen CD, Kretzler M, Kerjaschki D, Rudensky A, Nikolic B, Reiser J. Proteolytic processing of dynamin by cytoplasmic cathepsin L is a mechanism for proteinuric kidney disease. J Clin Invest 2007; 117: 2095-2104. Asanuma K, Kim K, Oh J, Giardino L, Chabanis S, Faul C, Reiser J, Mundel P. Synaptopodin regulates the actin-bundling activity of alpha-actinin in an isoform-specific manner. J Clin Invest 2005; 115: 1188-1198. Kemeny E, Durmuller U, Nickeleit V, Gudat F, Mihatsch MJ. Distribution of podocyte protein (44 KD) in different types of glomerular diseases. Virchows Arch 1997; 431: 425-430. Srivastava T, Garola RE, Whiting JM, Alon US. Synaptopodin expression in idiopathic nephrotic syndrome of childhood. Kidney Int 2001; 59: 118-125. Zima T, Tesar V, Stípek S, Crkovska J, Poledne R. The influence of cyclosporin on lipid peroxidation and superoxide dismutase in adriamycin nephropathy in rats. Nephron 1997; 75: 464-468. Zima T, Tesar V, Rychlak I, Namecek K, Poledne R. The influence of pefloxacine on experimental adriamycin-induced nephrotic syndrome in rats. Ren Fail 1996; 18: 195-199. Zhao YF, Zhu L, Liu LJ, Shi SF, Lv JC. Measures of urinary protein and albumin in the prediction of progression of iga nephropathy. Clin J Am Soc Nephrol 2016; 11: 947-955. Tsai WC, Wu HY, Peng YS, Ko MJ, Wu MS. Risk factors for development and progression of chronic kidney disease: a systematic review and exploratory meta-analysis. Medicine (Baltimore) 2016; 95: e3013. Huang J, Liu G, Zhang YM, Cui Z, Wang F, Liu XJ, Chu R, Zhao MH. Urinary soluble urokinase receptor levels are elevated and pathogenic in patients with primary focal segmental glomerulosclerosis. BMC Med 2014; 12: 81. Mallipattu SK, He JC. The podocyte as a direct target for treatment of glomerular disease? Am J Physiol Renal Physiol 2016; 311: F46-51. Reiser J, Altintas MM. Podocytes. F1000Res 2016; 5. Perico L, Conti S, Benigni A, Remuzzi G. Podocyte-actin dynamics in health and disease. Nat Rev Nephrol 2016; 12: 692-710. Chuang PY, He JC. Signalling in regulation of podocyte phenotypes. Nephron Physiol 2009; 111: p9-15. Tian X, Ishibe S. Targeting the podocyte cytoskeleton: from pathogenesis to therapy in proteinuric kidney disease. Nephrol Dial Transplant 2016; 31: 1577-1583. Kistler AD, Peev V, Forst AL, El Hindi S, Altintas MM. Enzymatic disease of the podocyte. Pediatr Nephrol 2010; 25: 1017-1023. Sullivan S, Tosetto M, Kevans D, Coss A, Wang L. Localization of nuclear cathepsin L and its association with disease progression and poor outcome in colorectal cancer. Int J Cancer 2009; 125: 54-61. Luft FC. From furless to heartless-unraveling the diverse functions of cathepsin L. J Mol Med (Berl) 2009; 87: 225-227. Mundel P, Reiser J. Proteinuria: an enzymatic disease of the podocyte? Kidney Int 2010; 77: 571-580. Garsen M, Rops AL, Dijkman H, Willemsen B, van Kuppevelt TH. Cathepsin L is crucial for the development of early experimental diabetic nephropathy. Kidney Int 2016; 90: 1012-1022. He L, Sun Y, Patrakka J, Mostad P, Norlin J, Xiao Z, Andrae J, Tryggvason K, Samuelsson T, Betsholtz C, Takemoto M. Glomerulus-specific mRNA transcripts and proteins identified through kidney expressed sequence tag database analysis. Kidney Int 2007; 71: 889-900. Oh J, Reiser J, Mundel P. Dynamic (re)organization of the podocyte actin cytoskeleton in the nephrotic syndrome. Pediatr Nephrol 2004; 19: 130-137. Liao R, Liu Q, Zheng Z, Fan J, Peng W, Kong Q, He H, Yang S, Chen W, Tang X, Yu X. Tacrolimus protects podocytes from injury in lupus nephritis partly by stabilizing the cytoskeleton and inhibiting podocyte apoptosis. PLoS One 2015; 10: e0132724. Yaddanapudi S, Altintas MM, Kistler AD, Fernandez I, Möller CC, Wei C, Peev V, Flesche JB, Forst AL, Li J, Patrakka J, Xiao Z, Grahammer F, Schiffer M, Lohmüller T, Reinheckel T, Gu C, Huber TB, Ju W, Bitzer M, Rastaldi MP, Ruiz P, Tryggvason K, Shaw AS, Faul C, Sever S, Reiser J. CD2AP in mouse and human podocytes controls a proteolytic program that regulates cytoskeletal structure and cellular survival. J Clin Invest 2011; 121: 3965-3980. Castellino F, Heuser J, Marchetti S, Bruno B, Luini A. Glucocorticoid stabilization of actin filaments: a possible mechanism for inhibition of corticotropin release. Proc Natl Acad Sci USA 1992; 89: 3775-3779. Koukouritaki SB, Lianos EA. Glucocorticoid effect on human mesangial cell cytoskeletal proteins. J Lab Clin Med 1999; 133: 378-383. Ransom RF, Lam NG, Hallett MA, Atkinson SJ, Smoyer WE. Glucocorticoids protect and enhance recovery of cultured murine podocytes via actin filament stabilization. Kidney Int 2005; 68: 2473-2483.